At Northern Basement Systems, we understand that a basement represents a very large section of space in your home. If you live in a one-story home, your basement could be half of your total square footage! 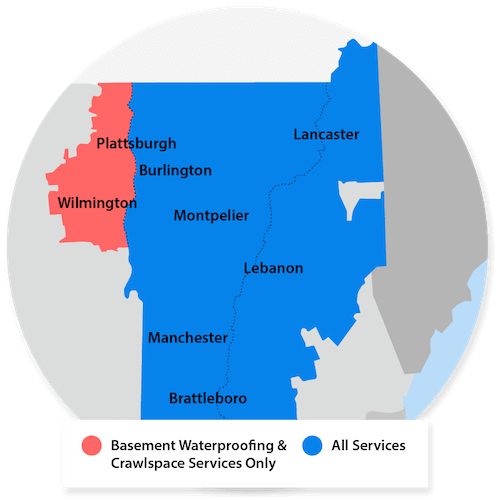 Our contractors at Northern Basement Systems offer basement waterproofing estimates from certified trained professionals in the Keene, Burlington, Colchester, Laconia, Rutland, Bennington, South Burlington, St Albans, Montpelier, Brattleboro, Lebanon, South Woodstock, Claremont, Concord, Milton, Berlin, Hanover area. Locally Owned And Operated Contractors: Northern Basement Systems is locally owned and operated. They're a stable, well-established company that's there when you need them! If you live in Burlington, Keene, Colchester, Keene, Burlington, Colchester, Laconia, Rutland, Bennington, South Burlington, St Albans, Montpelier, Brattleboro, Lebanon, South Woodstock, Claremont, Concord, Milton, Berlin, Hanover or nearby, our company has the certified trained contractors for you! We offer free basement waterproofing quotes to homeowners on affordable basement waterproofing within our service area.